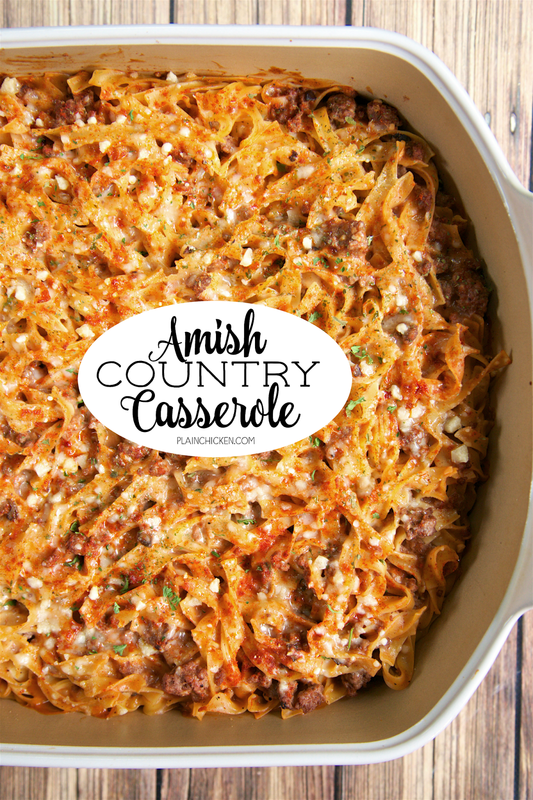 Amish Country Casserole - comfort food at its best!! Hamburger, Tomato soup, cream of mushroom, onion, garlic, milk, Worcestershire sauce, egg noodles and parmesan cheese. SO simple and tastes amazing! Everyone cleaned their plate!!! 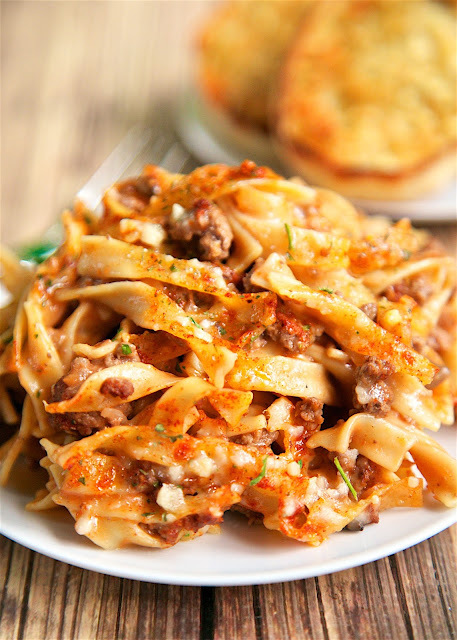 Makes a great freezer meal for an easy weeknight dinner. 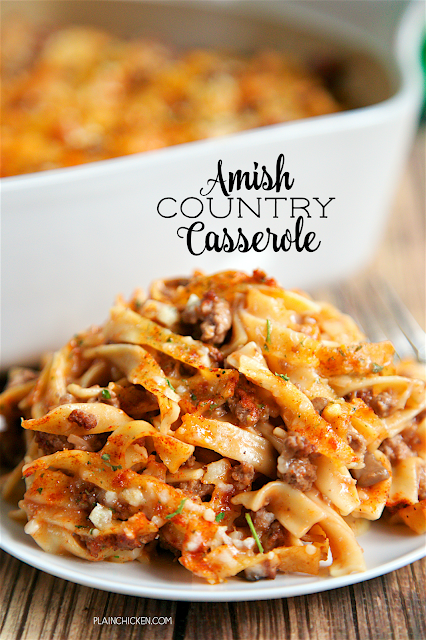 This Amish Country Casserole combines a few simple ingredients to make a delicious, comforting casserole. You probably already have all the ingredients in the house now! We had this for dinner the other night, and Chicken Legs couldn't stop raving about it. He ate it for dinner and reheated some leftovers for lunch the next day. He loved it!! This casserole can be made ahead of time and frozen for later for a quick and easy weeknight meal. Assemble the casserole, don't bake it, cover it with foil and pop it in the freezer. When you're ready to make it, take the casserole out of the freezer the day before and let it thaw in the refrigerator. Pop it in the oven when you get home from work and dinner is ready in a flash! Easy Peasy! We like to serve this with some green beans or a side salad. It has quickly become a family favorite! In a large bowl, combine tomato soup, cream of mushroom, milk, salt, pepper, Worcestershire, garlic and onion flakes. 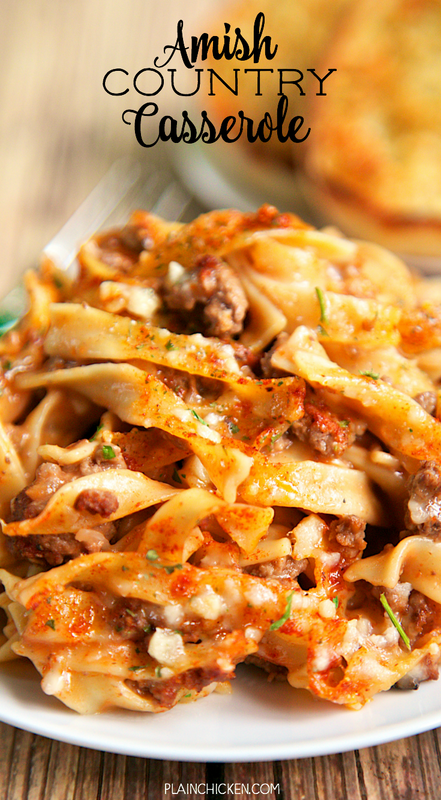 Stir in cooked ground beef and cooked noodles. Spread noodle mixture into prepared pan. Top with grated parmesan cheese. This looks delicious, however my husband does not eat mushrooms. Any suggestions for a substitution for the cream of mushroom soup? I don't eat mushrooms either, but I used the cream of mushroom soup. You can substitute cream of chicken or cream of celery. Get a new husband. Mushrooms are delicious. My mom didn't like mushrooms either, but if they were the size like they are in the Cream of Mushroom soup, she was fine and could do it. Looks like a great version Steph. Can this be made on the stove top? My oven is on the outs right now? Sounds delicious! It does sound really good! I'm not sure what onion flakes are though? Onion flakes are dehydrated onions. They can be found at any bulk store such as Bulk Barn or in the bulk section of your grocery store. Dehydrated onions. They can be found in the spice aisle at your grocery store. Can I cook and bake the same day or do I have to freeze and do it later. Yes - I didn't freeze the casserole. I put the freezer directions in the recipe for those who want to save it for later. Awesome. I will be making this tonight thabk you. what about freezing cooked portions of it? doable? or best frozen unbaked? I agree, replace the husband, not the mushrooms! Excellent recipe. Wish my word was good enough - it was really good. I don't post recipes if we don't enjoy them. I am cooking it right now, can't wait to taste it. Does anyone have the calorie count and servings of this dish? 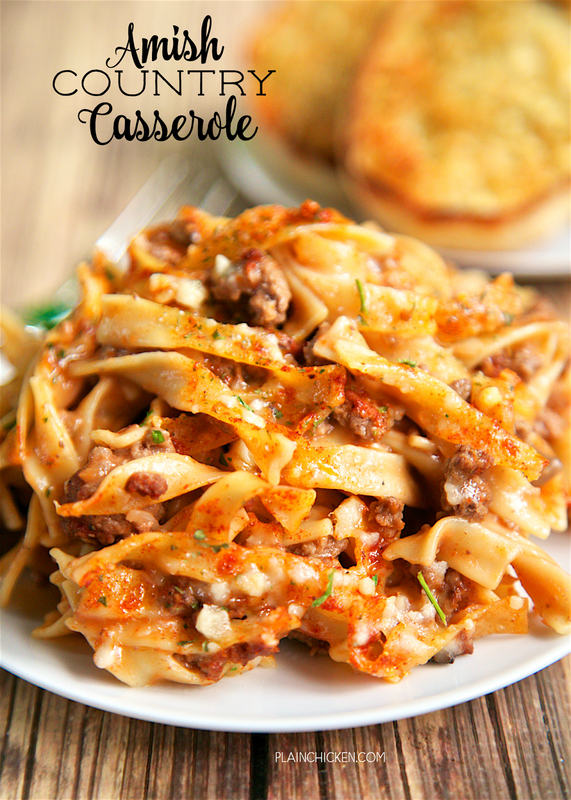 Hard to find casserole recipes that aren't tomato based, especially for ground beef. I will be making this for dinner two nights from now, and I'm sure it will be great. Thanks for the recipe. Could you put real onions in instead of the flakes. I used onion powder and it still tasted great. Only used 1/2 cup of milk though. Great recipe! Does it need to be Campbell's Condensed Tomato or does a non condensed tomato soup work? I used Campbell's condensed soup. Enjoy! I made half of the batch tonight. And froze the other half. (Loving this option) I don't eat meat, so this was purely a hubby meal. He commented that the flavor didn't stick to the noodles enough... I'm thinking that after I added the milk to the soup/seasoning it looked a little too liquid-y. Going to try it without the milk next time, but still using everything else, and then I think it will work out better. I also think I added too many noodles, so that probably contributed too! Thanks for the recipe!!! I'm loving your site, especially since my husband is very picky and I think that for most of these recipes he has a chance at trying and liking! If you stir in a tablespoon of apple cider vinegar to the noodles after you cook them, they will absorb more of the flavor or the sauce. You won't taste the vinegar but it will help the noodles absorb the sauce. Thanks for all of the great recipes. I always get a little confused when a recipe calls for grated parmesan cheese, does that mean freshly grated or that stuff in the green can? Either is fine - enjoy! Is the garlic minced, powder or garlic salt? This dish is great. My kids loved it which is huge. They can be picky. I did only use 1/2 cup of milk and cooked it for 23 minutes. It tasted great! My family loved this meal! My daughter eagerly told her brother "I didn't think it would be good, but it actually tasted good!" Now they are asking me to make it again! It's definitely going to be a regular meal at our house. Made this last year...using the 1 1/2 lbs.Hamburger, Yellow Harvest tomato Soup, Cream of Chicken Soup, and no Worcestershire Sauce...'cause that is what I had/didn't have. Came out GREAT!!! Wish I had remembered that I had canned mushrooms downstairs. I'm from Ohio Amish country and have many Amish friends. They call this dish, Yumasetta. Means " Should we do it" in Dutch. It's very good. They always use cheddar opposed to parmesan.